This weekend marked the culmination of a “Week of Action” to protest the growing use of armed drones by US and British forces in the Middle East. Drones – or “unmanned aerial combat vehicles” (UCAVs) – are semi or fully-autonomous (i.e. robotic) aircraft without a human pilot or crew onboard, instead flown by British and American military personnel via remote control from Air Force bases up to 7,000 miles away in the Nevada desert or Syracuse, New York. 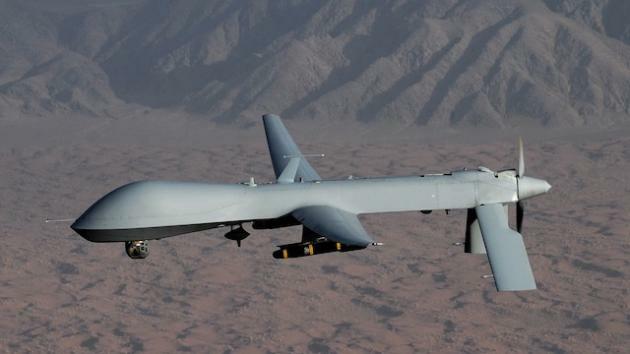 The United States and Britain have deployed drones in Pakistan and elsewhere in the Middle East as part of the ongoing “War on Terror” since 2004 (although their use was only first formally acknowledged earlier this year). In addition to aerial reconnaissance, drones armed with guided Hellfire missiles have been used to wage a covert, controversial and legally dubious campaign of “targeted assassinations”, responsible for the deaths of thousands of “militants” – a term which, under the Obama administration, has been deceptively redefined to include all military-age males within a strike zone. Despite claims from the White House – echoed by Downing Street – that allied drone strikes are ‘exceptionally surgical and precise’ and ‘do not put… innocent men, women and children in danger’, hundreds of civilians are already counted among the dead in this covert “war on terror”. In recent years, a host of civilian government and law enforcement agencies have begun to take an interest in drone technology. Within the US, Customs and Border Protection has spent around $100 million on UAVs – including six unarmed Predator drones – to patrol both its southern and northern borders in efforts to restrict illegal immigration and as part of the “war on drugs”. The notoriously brutal LAPD – long seen by many in the black community as an occupying (para)military force – was the first police force to use the technology, flying a lightweight SkySeer surveillance drone over the streets of South Central since 2006. Since then, the Department of Homeland Security has awarded hundreds of thousands of dollars in grants for small UAVs to at least 13 police departments, and the Supreme Court has ruled that individuals have no right to privacy from police observation from public airspace. Until now, restrictions imposed by the Federal Aviation Administration (FAA) have kept many drones on the ground. However, Congress recently passed a law requiring the FAA to loosen these restrictions and most police forces are expected to be able to fly small UAVs by next year. In the meantime, the New York Police Department is “investigating the possible use of UAV’s as a law enforcement tool”, whilst the Miami-Dade Police Department already has a fleet of drones ready to fly. Within the UK, arms manufacturer BAE Systems was revealed in 2010 to be working alongside several government agencies to develop an unprecedented national strategy for the use of drones by police in “routine” surveillance, monitoring and evidence gathering. According to a recent report by Drone Wars UK, the British government has spent £2 billion on military drones since 2007. BAE, which already produces a range of UCAVs for use in warzones such as Afghanistan and Iraq – including the deadly Mantis and stealth bomber-style Taranis drones – are now reported to be adapting military-style drones for a range of police uses. At least four constabularies are known to have already used or trialled drones, with many more expressing an interest in the technology. However, those aircraft trialled so far have been little more than small remote-controlled helicopters fitted with cameras. Furthermore, British law enforcement’s forays into UAV surveillance have met with decidedly mixed results. Merseyside police have reportedly trialled a lightweight helicopter-style drone from 2007 until early 2010 when they crashed the £13,000 UAV into the River Mersey. To make matters worse, the force could face prosecution for using the aircraft without a license – a criminal offence. The British Transport Police apparently conducted a short trial with a similar model, though eventually deciding not to purchase one. Meanwhile, a drone acquired by Essex police has been left to languish in a warehouse after the force decided it wasn’t worth the money. 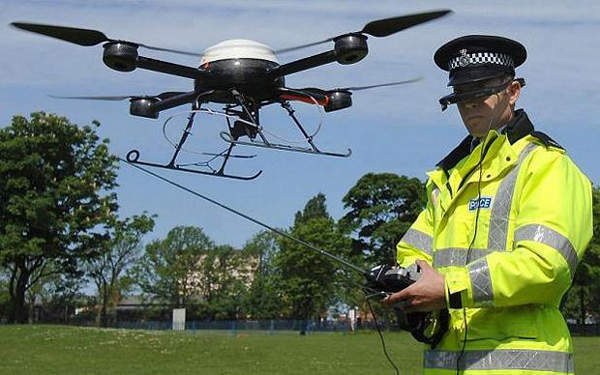 Whilst Staffordshire police have managed to use a drone to spy on revellers at V Festival, they were unable to fly it over the main arena because of fears it might crash and injure someone. Most recently, plans to use larger military-style drones for aerial crowd surveillance during the London 2012 Olympic Games were hampered by Civil Aviation Authority (CAA) regulations. However, the prospects for drone surveillance by British law enforcement agencies look likely to change in the near future. Speaking at the launch of a new National Police Air Service last week, police minister Damian Green endorsed the use of drones by British police for aerial surveillance purposes. “Drones are like any other piece of kit” claimed Green; “Where it’s appropriate or proportionate to use them then we will look at using them”. For his part, Chief Constable Alex Marshall further remarked that whilst drones are not currently used in “mainstream policing… they may well offer something for the future”. According to Chris Cole from Drone Wars UK, current CAA regulations are too severe for police drone use to be practical for most forces, although this may be set to change in the next few years (the CAA has already licensed the testing of drones at ParcAberporth in Wales). Regulations regarding small radio-controlled aircraft however remain “dangerously lax”, according to Emma Carr from privacy and civil liberties campaign group Big Brother Watch, and this is “something it appears those selling drones are keen to exploit”. The answer may be: not that long at all; a $300,000 Vanguard Shadowhawk drone purchased by the Montgomery County Sherriff’s Department is already capable of firing rubber bullets, tear gas canisters and taser projectiles. According to Salon, an Ohio police lieutenant interested in the drone was told by Vanguard representatives that it can also carry grenade launchers and 12-gauge shotguns. Particularly worrying here is how drone surveillance tends to abstract people from their contexts, reducing variation and ambiguity that might otherwise impede action – such as pepper spraying or shooting a suspect – by trigger-happy police. A year ago the UK was shaken by rioting on a scale not seen in decades, a key contributing factor to which was the disastrous breakdown of relations between police and inner-city communities. According to the Guardian’s “Reading The Riots” survey, many involved in the disorder cited policing as the single most significant cause of the riots. In light of this, it seems reasonable to suggest that the kind of “remote control” policing-at-arms-length that drone-based technology inevitably encourages, whereby the local community is viewed from afar in a form of mechanised surveillance that dehumanises both the watched and the watcher, is precisely what is not needed. Withdrawing from the beat to watch over the streets through electronic “eyes in the sky” will only stand to further alienate an already overwhelmingly and visibly homogeneous (white, male, “respectable” working-class) police force from the diverse inner city communities it exists to serve. Furthermore, the use of drones by police will be seen by many as a refusal to engage with the public at the most fundamentally human level, and thus further undermine their already dwindling legitimacy. Thanks Theo, this piece is incredibly informative (and subsequently very worrying). As you highlighted so well, the case of trigger happy police is hardly exceptional. Throw a remote control trigger into the mix and the programme of state violence is further enhanced. I’d be interested to learn how people can counter drones, both before their wide scale rollout and as dangerous devices. This reminds me of the movie eye in the sky. How they did surveillance with drone for hours. They even had this tiny mechanical pigeon for surveillance. if you’re installing wireless security cameras yourself, you want the option to view them remotely. Not all cameras provide remote control and sneak peeks. It’s easy enough to make sure that you are buying a camera that includes remote access. However, one thing you should look into is how you’re going to actually access that camera. Looking to view real-time video from a web browser? Make sure that’s an option. Even more importantly, check to see if that camera supports your smartphone/tablet platform. Some cameras work with iOS devices, some work with Android, and some work with both. Unfortunately, not as many work with BlackBerry and the Windows Phone. Make sure to read the fine print! This was a well outstanding informative post you have shared on this page about the drones of sky printing . This allows you to connect your Smart Phones , Tables and other Wi-Fi devices to it as you would any wireless router. The difference is you’re connecting over a cellular connection rather than a broadband network. 4G LTE (Long-Term Evolution) devices can be just as fast as many home Wi-Fi networks.